It’s been five years since Eternal Reign’s last sign of life with their second album Forbidden Path which I couldn’t find much to like on. Since then, the sextet from Bremen had to fight with a lot of difficulties, and while the songwriting process was completed already in 2008, it still took them another two years to finally release their new CD The Dawn Of Reckoning. The band has signed to a new label, had to find a replacement drummer, but otherwise not much has changed, apart from the fact that this time I have a generally more favourable impression. 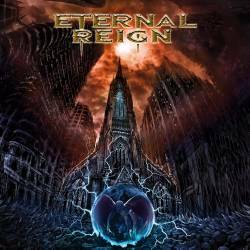 Eternal Reign’s chosen sound is progressive power metal, with a strong emphasis on melodic components. Traces of American bands like Symphony X and Kamelot are undeniable, but Eternal Reign take care to maintain a European sound. The album starts with a slow piano and strings accompanied ballad which prepares the ground for what’s to follow. The many years of experience clearly show, with Eternal Reign moving effortlessly between mid-tempo and faster parts, never abandoning their highly melodic approach. They keyboards add a nice texture but are of course overshadowed but the guitar duo. My main problem with the band still lies in the vocal department, with Dirk Stühmer seemingly trying his hardest to land an audition for Judas Priest. A more charismatic singer with a more powerful and muscular voice would have strongly improved the listening experience. Towards the end of the record, we get a cover version of Black Sabbath’s Devil And Daughter, originally released on their late-Eighties album Headless Cross. It shows a lot about Eternal Reign that they opted for a track from the Tony Martin era, instead of going for the more classical Ozzy or Dio classics. The short hour ends with the insipid ballad Still Remains. The Dawn Of Reckoning is certainly a very decent record and should allow Eternal Reign to hold their ground in the vast progressive power metal scene. The vocals may deter some potential customers, so that it is advised that you give this album a listen before you decide on a possible purchase. Let’s only hope that Eternal Reign won’t have their fans wait for another five years before the next release.